When you get to the point of taking the steaks out of the sous vide pot, it’ll take you less than 10 minutes to get a sear on the elk steaks, have them set, and slab them on your plate. Make sure your sides are prepared in a time that match the steak cooking timeline. Do a search for my cauliflower mashed potato recipe to eat as a side. The balsamic blueberry sauce yields about 1 cup. The flavor of this sauce is similar to cranberry sauce – tart, with a hint of sweet. Set sous vide to 130°F for medium-rare and let it heat-up as you prep your steaks. 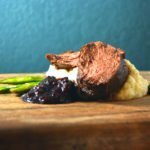 Trim elk steaks of any silverskin. Sprinkle a little salt and pepper over the elk steaks and add to your sous vide bag. Make sure to not overlap the steaks – if you have to use multiple bags to ensure none of the steaks overlap, do it. Add a rosemary sprig and sliced garlic clove to the bag. The amount you use depends on how much you would use with cooking normal steaks. If I’m putting 2 pounds of elk steak in the bag, I’ll slice one medium clove of garlic and add half a sprig of rosemary. If you’re using a vacuum seal bag, vacuum seal the bag, and put it in the sous vide heated pot for 1 hour (add 30 minutes to the time if you’re cooking from frozen). If you’re using a ziploc bag and doing the water displacement method (where you slowly lower the bag into the water to get the air out of the bag before completely sealing it), so ahead an slowly start to lower the bag in the water, seal it up, and let it cook in the sous vide pot for 1 hour (again, adding 30 minutes to the time if you’re cooking from frozen). After the 1 hour of cooking, you’ll pull the elk steaks out of the sous vide pot, and will notice that they’re still reddish-pink. That’s fine, you’re going to get the color in the next step. Get a cast iron skillet smoking hot – often times, I achieve this by sticking the pan in a 350°F oven for 10 minutes. The point is to get the pan as hot as you possible can so you get a really good sear on the elk steaks. The next step is going to be fast, so make sure you have your elk steaks near by, ready to go, as well as, a couple pats of butter and a cutting board they can rest on after they’re seared. Add a little olive oil to the pan to help prevent the elk steaks from sticking. Add the elk steaks, leftover rosemary sprig, garlic, and a pat of butter to the top of each elk steak. Cook the elk steaks on one side for 2 minutes, flip, and cook on the other side for 1 minute. Remove the seared elk steaks to cutting board and tent with foil for 5 minutes. Add the minced garlic and saute until you start to smell that nutty, garlic smell (about 2 minutes). Have you balsamic vinegar ready to pour in, so your garlic doesn’t overcook. Pour in your balsamic vinegar, and then add the blueberries, rosemary, honey, brown sugar, and cognac. Zest a lemon into the pot. Slice the lemon open, and squeeze 1 lemon half of juice into the pan. If you don’t have a lemon/lime juicer, juice the lemon over a bowl to prevent the seeds from going in the pan. Simmer sauce for 30 minutes to reduce down and make balsamic reduction. If you want to speed this up, just turn the heat up to medium-high and cook at a hotter temperature, but remember to check on the sauce more often to make sure it doesn’t get overcooked. When the blueberries get soft, use a spoon to squish the berries against the saucepan. If you have an immersion blender, use that to help speed things up, but remember to keep it in the sauce or balsamic blueberries sauce will go everywhere (I’m speaking from experience and a newly, stained Under Armour shirt). The sauce is done when it’s thick enough to stick to the back of a spoon. Serve over steaks or alongside steaks as a dipping sauce. Because the Balsamic Blueberry Sauce make so much, I usually refrigerate it and plan on steaks again within the next couple of days. You can always cut the sauce in half so you don’t have so much left over.